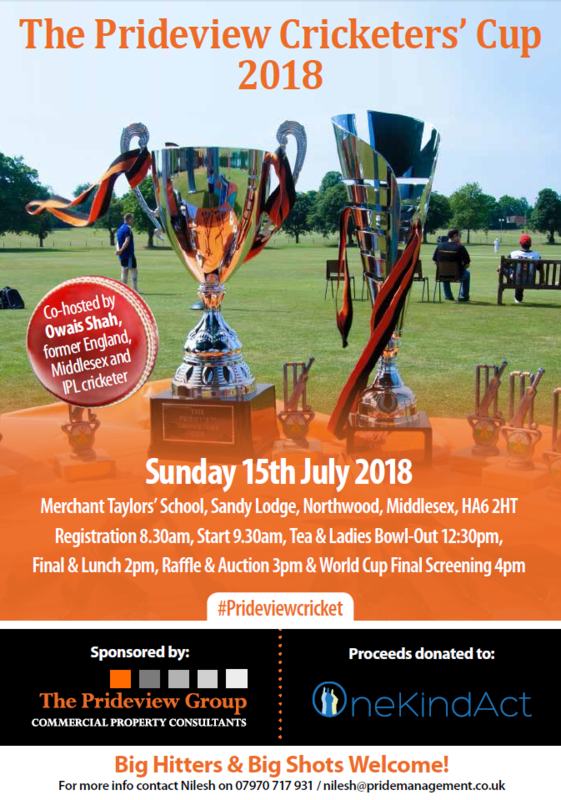 Our annual charity cricket day, The Prideview Cricketers’ Cup, continues to go from strength to strength, with this year’s tournament, our 7th one, raising a record amount of £21,778 for our chosen charity, One Kind Act – taking the total raised by the event since it began to over £100,000!! Click here to see the pictures and click here to watch some aerial video highlights from the day! Thank you to all participants, donors, sponsors and volunteers for this fantastic effort!! Click here to see the tournament brochure once again, which details all the participants and sponsors. Healing Little Hearts – Sending specialist medical teams from the UK to perform life-saving operations on children with congenital heat disease. Project Chirag – Providing solar-based lighting solutions to remote villages in Rajasthan. Jugnu Pre-School Programme – Supporting 100 slum children in Kolkata with education and nutrition. This year we limited the event to 8 teams to accommodate a screening of the FIFA World Cup Final and unfortunately this meant the Prideview team had to stand down. This provided opportunities for new teams to join the PCC community and we were delighted to welcome 4 new entrants to the competition (B&S Capital, Allsop, Jaspar Group and Harold Benjamin). The 8 teams were divided into two groups of 4 meaning each team had to play 3 hours of consecutive matches in the gruelling heat with the top 2 proceeding to the Prideview Cricketers’ Cup semi finals with the 3rd placed teams in each group battling it out for our plate trophy, The Prideview Champions Trophy. As expected reigning champions Jade Pharmacy topped group A whilst Axiom Stone, after winning the ‘battle of the lawyers’ against Harold Benjamin came out on top of Group B, taking bonus points in each of their 3 games too! Whilst the cricket carried on, there was plenty on offer for spectators of all ages. 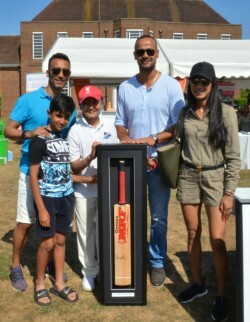 We were delighted to welcome Owais Shah, former England and IPL cricketer, to oversee The Ladies Bowl-Out which saw about 50 women tried their hand in The Ladies Bowl-Out with the eventual winner, Ullas Patel, claiming the top prize of a hand bag donated by Fendi! 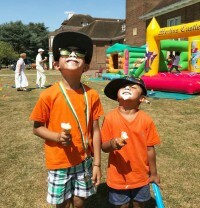 Kids were treated to a bouncy castle, soccer coaching class, face-painting, pizzas and ice creams. This year we also hosted several Market Stalls, comprising local businesses who made a donation in order to promote their goods and services to all in attendance: Personal trainers Jym Fitness, Jeweller retailer 101 Creations, Picture framing and art gallery Hetros Fine Art, Nutrition coach Sarita Marwaha and Physiotherapists R&D Physio. 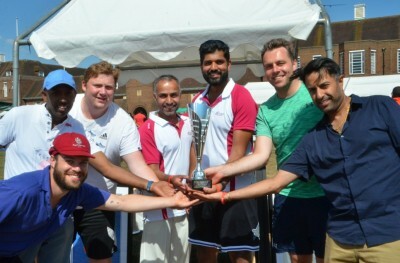 Focus soon returned to the business end of the tournament with the semi-finals of the main tournament (The Prideview Cricketers’ Cup) and the final of plate tournament (The Prideview Champions Trophy). Two teams called it a day at this stage, B&S Capital and Harold Benjamin, preferring to sit back, relax and enjoy the bar and food on offer whilst the remaining teams slugged it out. The PCT final was fought out between new entrants Allsop and Bentech and it was new boys Allsop who came out victors as their top bat Will Clough stole the show! 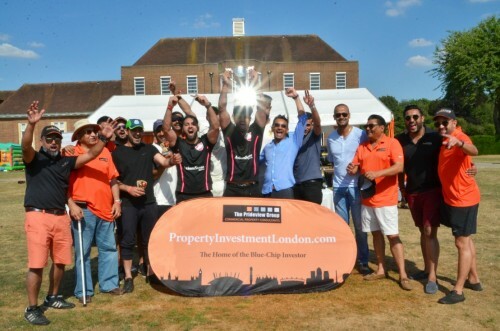 Allsop beat Bentech by 32 runs and won The Prideview Champions Trophy! Results from The Prideview Cricketers’ Cup were as follows. Jade Pharmacy, looking for their 4th consecutive Prideview Cricketers’ Cup almost stumbled to a very well supported Jaspar outfit, but snuck through on the last ball! Having smashed Axiom Stone to pieces the last time the two teams met in the PCC ’17 Semi Final, with a record 98 run margin having taken 7 wickets in their 5 overs, many thought it was going to be trophy number 4 for the supercharged pharmacists. 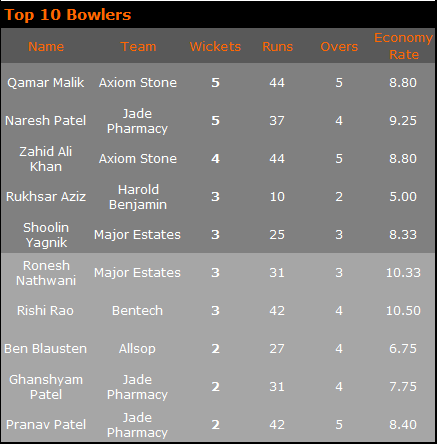 However this Axiom Stone side had not faltered once in the competition, and having put Jade into bat they proceeded to bowl an excellent line and length as well as take several key catches to restrict Jade Pharmacy to 39 runs. They continued a very professional display with the batting, with their top batter Zahid Ali Khan farming almost all of the strike in the first 2 overs taking 20 runs off the total. Their second pair of batsmen led by Summiey Khan continued the charge, plundering the remaining 19 runs almost with ease, leaving the final pair to just survive the last over. Jade Pharmacy’s powers, like those of most prescription drugs, had finally waned and they learned a lesson most of us know in property – don’t mess with your lawyer! 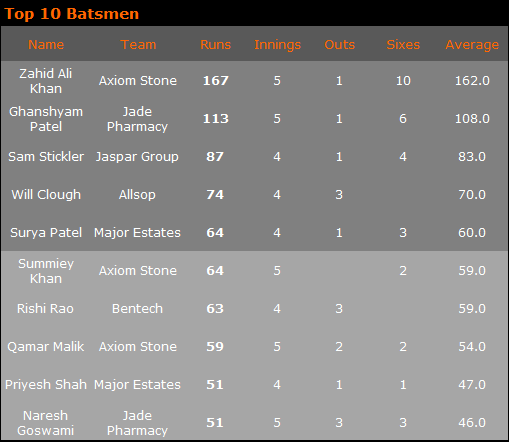 Axiom Stone beat Jade Pharmacy by 18 runs to win The Prideview Cricketers’ Cup! 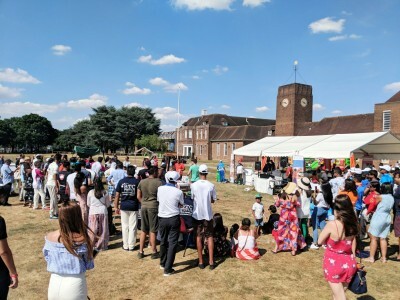 With the cricket finished and the FIFA World Cup Final looming, everyone gathered around for the Raffle and Auction. Just over £2,000 was raised in the Raffle with some fantastic prizes including a signed Yorkshire CC Shirt, Afternoon Tea at The Ritz and a Gin Hamper. Thanks to all those who donated prizes and sold raffle tickets, it certainly made a difference. It was then over to Will Clough, auctioneer at Allsop, who continued his fine form with the bat into the auction. He did not disappoint and neither did the generous audience. The auction was a resounding success raising nearly £5,000, with the top lot being a signed Virat Kohli bat which fetched £2,600! 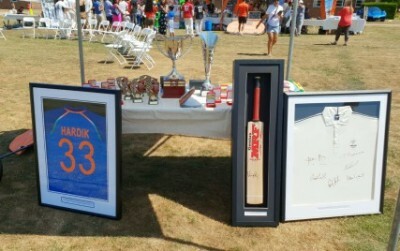 A framed shirt signed by Hardik Pandya went for £1,050 whilst a round of golf with Mark Ramprakash sold for £850 and a framed photo signed by a member of the 1966 World Cup winning side went for £290. Thank you all those who bid and those who helped us provide these lots, it has made a huge difference. For those of you with merchandise to donate, please note we are now accepting lots for our July ’19 auction! Click here to see the tournament brochure once again, giving details of all the participants and sponsors. Thank you and see you all next year, and remember if you would like to get involved in any way get in touch! Congratulations to top bat Zahid Ali Khan, who delivered probably the greatest performance in PCC history with a monster 167 runs, 10 sixes and 4 wickets too!